Last time we reminded ourselves of one of the ways in which cancer is odd but, of course, underpinning not just cancers but all the peculiarities of life is DNA. The enduring wonder is how something so basically simple – just four slightly different chemical groups (OK, they are bases!) – can form the genetic material (the instruction book, if you like) for all life on earth. The answer, as almost everyone knows these days, is that there’s an awful lot of it in every cell – meaning that the four bases (A, C, G & T) have an essentially infinite coding capacity. That doesn’t make it any the less wonderful but it does carry a huge implication: if something you can squeeze into a single cell can carry limitless information it must be the most powerful of all storage systems. We looked at the storage power of DNA a few months ago (in “How Does DNA Do It?”) and noted that its storage density is 1000 times that of flash memories, that it’s fairly easy to scan text and transform the pixels into genetic code and that, as an example, someone has already put Shakespeare’s sonnets into DNA form. Now Seth Shipman, George Church and colleagues at Harvard have taken the field several steps forward by capturing black and white images and a short movie in DNA. Moreover they’ve managed to get these ‘DNA recordings’ taken up by living cells from which they could subsequently recover the images. Crumbs! How did they do it? First they used essentially the text method to encode images of a human hand: assign the four bases (A, C, G & T) to four pixel colours (this gives a grayscale image: colours can be acquired by using groups of bases for each pixel). These DNA sequences were then introduced into bacteria (specifically E. coli) by electroporation (an electrical pulse briefly opens pores in the cell membrane). The cells treat this foreign DNA as though it was from an invading virus and switch on their CRISPR system (summarized in “Re-writing the Manual of Life”). This takes short pieces of viral DNA and inserts them into the cell’s own genome in the form of ‘spacers’ (the point being that the stored sequences confer ‘adaptive immunity’: the cell has an immunological memory so it is primed to respond effectively if it’s infected again by that viral pathogen). In this case, however, the cells have been fooled: the ‘spacers’ generated carry encoded pictures, rather than viral signatures. Because spacers are short it’s obvious that you’ll need lots of them to carry the information in a photo. To keep track when it comes to reassembling the picture, each DNA fragment was tagged with a barcode (and fortunately we explained cellular barcoding in “A Word From The Nerds”). Once incorporated in the bugs the information was maintained over many bacterial generations (48 in fact) and is recoverable by high-throughput sequencing and reconstruction of the patterns using the barcodes. Simple. In principle they used the same methods to encode sequential frames. Top: Using triplets of bases to encode 21 pixel colours. 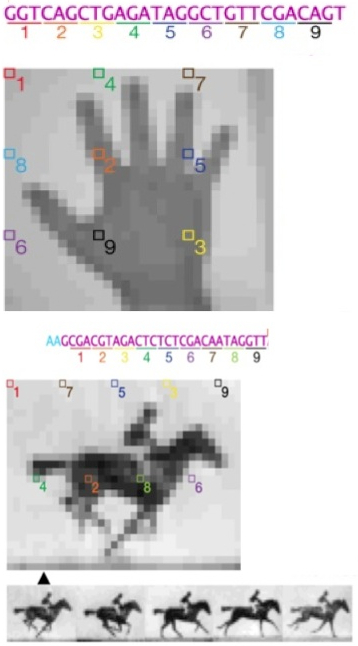 Images of a human hand (top) and a horse (bottom) were captured. For the movie they used freeze frames taken in 1872 by the English photographer Eadweard Muybridge. These showed that, for a fraction of a second, a galloping horse lifts all four hooves off the ground. Seemingly this won a return for the sometime California governor, Leland Stanford (he of university-founding fame) who had put a wager on geegees doing just that. From Shipman et al., 2017. You can see the movie here. To recap, in case you’re wondering if this is some scientific April Fools’ prank. What Church & Co. did is scan pictures and transform pixel density into the genetic code (i.e. sequences of the four bases A, C, G & T). They then made DNA carrying these sequences, persuaded bacteria to take up the DNA and incorporate it into their own genomes and, after growing many generations of the bugs, extracted their DNA, sequenced it and reconstructed the original images. By scanning sequential frames this can be extended to movies. It’s not science fiction – but it is pretty amazing. With a droll turn of phrase Seth Shipman said “We want to turn cells into historians” and the work does have significant implications in showing something of the scope of biological memory systems. Won’t be long before the trendy, instead of birthday presents of electronic family photo albums, are giving small tubes of bugs! Shipman, S.L., Nivala, J., Macklis, J.D. & Church, G.M. (2017). CRISPR–Cas encoding of a digital movie into the genomes of a population of living bacteria. Nature 547, 345–349.